One of the largest cities in the U.S., Phoenix real estate is always booming. Phoenix, Arizona contains a wide variety of listings, from luxury and golf homes to inexpensive homes and condos. There is something for everyone in this city. Phoenix is lively, with plenty of action; museums and entertainment venues are plentiful and varied. The downtown scene is small considering the size of the city, and while it is decidedly a large urban area, tall buildings are less important to the residents than the view of the natural landscape and mountains encircling the city. The Phoenix metro area is also known as the “Valley of the Sun”, and it’s the 13th largest metro area in the United States. Phoenix is also the county seat of Maricopa County and is one of the largest cities in the United States. The famous city was settled in 1867 as an agricultural community. The city became incorporated as a city in 1881. Because the city is incredibly large there are numerous things to do. You will find shopping, parks, outdoor recreation, dining of all cuisines, entertainment venues, and much more in this wonderful city. There are many homes that range in sizes and style available in the city. You will find a little bit of everything here, including single family homes, apartments, urban condominiums, town homes, and large estates. The median home value is $170,800. The home value rate has risen by 2.4% in the past year and it’s predicted to rise by another 3.6% in the coming year. 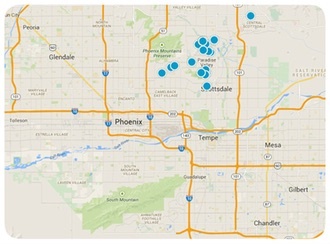 The median price per square foot is $126 and this is higher than Phoenix Metro’s median of $124. If you are looking for a Phoenix home for sale, browse through the extensive Arizona real estate listings we have access to, and let us help you find the neighborhood and home that is right for you and your family. Whether you are on a budget or looking for a larger investment, we can find what you want, so for your Phoenix home, count on the Russell Shaw Group.